You thought you had paying for college all figured out, didn’t you? Long before that first tuition check was due, you enlisted the help of your parents and diligently filled out the FAFSA (Free Application for Federal Student Aid), scoring a decent package of government grants and loans. And even though financial aid didn’t cover everything, your plan to pay the rest of the bill – through your leftover summer job money, your parents’ checkbook, and a handful of scholarships – worked out beautifully. But if you’re approaching the end of your freshman year now, you may find yourself in a financial lurch. Those scholarships that helped cover the gap between your financial aid package and what you and your family could afford to pay were likely only one-time awards. And even though they were incredibly valuable to you – helping to ease the financial burden at a time when you had much more important things to worry about, like getting settled into collegiate life – you can no longer rely on those scholarships come sophomore year. Instead of panicking and taking out large amounts of student loans, or dropping out altogether, take a step back and realize that you have options. There are actually a plethora of resources available to students beyond freshman year – you just have to know where to look. 1. First things first: visit your college’s financial aid office. 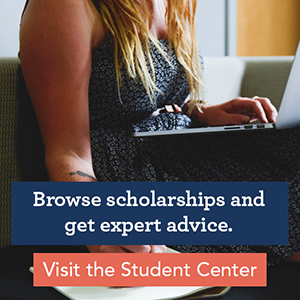 Most colleges and universities have scholarships available to students already enrolled in classes, or they can direct you to the scholarship opportunities they’re familiar with for current students. Get to know the financial aid folks at your university, suggests Joseph Russo, former Director of Financial Aid at the University of Notre Dame. “The primary source of information about student aid opportunities and resources is the college/university to which the student is [attending]. The vast majority of student aid resources are going to be made available through those financial aid offices,” he says. 2. Reapply to past scholarship programs. Did you receive a one-time award your freshman year from a local community organization or a parent’s place of employment? You may be able to earn this scholarship a second year in a row. Many scholarships may be one-time awards, but that doesn’t mean you can’t reapply and earn the scholarship again. 4. Look for renewable scholarships. Not being able to afford tuition is one of the most common reasons why a student drops out of college. For this reason, scholarship providers are increasingly recognizing the importance of helping students pay for college beyond freshman year and providing them with support throughout their college career. For example, Scholarship America recently introduced the Dream Award, a program open only to current college students who need funding for their second, third and fourth years of college. When conducting your search, pay special attention to these renewable scholarships, and you may be able to avoid being in this same position next year. 5. Most importantly, do not drop out before exploring all your options. We know paying for college is challenging. But we want to reiterate: before you panic and move out of your dorm, visit your college’s financial aid office and explain your financial situation. More often than not, they can find scholarships, grants or emergency support to get you through the next year of college.